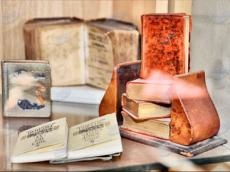 Baku Museum of Miniature Books is one of the most interesting museums in Azerbaijan. The Museum is settled in the old part of Baku. Its activity started on April 23, 2002. The museum management reported that 5,200 miniature books from 71 countries are exhibited here. Three of the micro books shown here are rare. Their size is 2x2 mm. These books are decorated with stones. Size of the largest book is 100x100 mm. The oldest book of the Museum is the Koran. The holy book brought from Saudi Arabia is presented in two copies, and refers to the XVII century.